The simple act of giving a child a coloring book on the high mountain island of Amantani on Lake Titicaca, where we have been taking small groups for years, bridges our cultures. It also helps reach out by giving a little something back. By no means is it as big as building a school, or other major project that other more established organisations are doing in Peru. As mother Teresa said, “Peace begins with a smile,” and in this case a coloring book, then a smile. We at Mountain Spirit Institute believe that to truly connect with others in our world, when we travel its good to reach out in anyway you can. 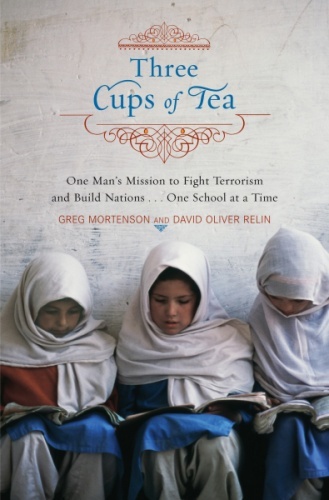 Reaching out might be that smile, the coloring book, or listening well to the people you’re visiting rather than building them what you think they need, a good lesson from Greg Mortenson’s Three Cups of Tea. Of course listening well implies you need a good interpreter or hopefully have studies the local lanquage, and I don’t mean Spanish. Next time you travel, load up on some coloring books and colored pencils. Leave the chocolates at the city, and take some paper and pencils instead. The local kids will love it, and you’ll smile too. In A New Heaven New Earth, Eckart Tolle says that violence for violence sake is the pain body‘s way of seeking food. Violent films are made by pain bodies for pain bodies to view. He also wrote, however, that if a film, such as a documentary or drama about the Vietnam war or World War II for example, use violence to illustrate the madness of the human mind, to wake us up to the insanity of the egoic mind, then violent depictions can have a role in showing us a way to becoming more fully conscious. I’m still on the fence about Tolle’s comments. 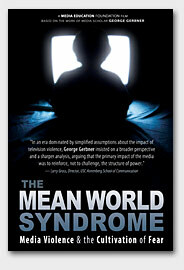 Meanwhile, the highly respected Media Education Foundation has just produced a new DVD called Mean World Syndrome. 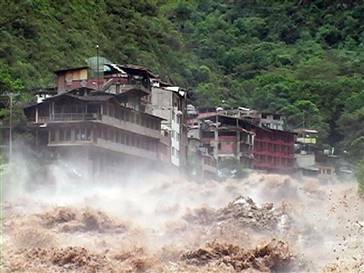 Helicopters ferried almost 600 more tourists from the Machu Picchu area after rains slackened Wednesday, leaving up to 1,600 travelers still stranded by mudslides blocking the only land route from the famed Inca citadel. Authorities said airlifts would continue throughout the week because more tourists had shown up at the evacuation site on foot after completing treks along the Inca trail to Machu Picchu, the 15th century Incan fortress that is 8,000 feet above sea level. Rain-fueled mudslides on Sunday cut the train line that is the only transport link to the remote region atop an Andean mountain ridge. Adding to the worries, tourists flown out Wednesday reported that a rain-swollen river had eroded the site where rescue helicopters are landing. Stranded tourists charged they are being victimized by price-gouging because food, water and accommodations are scarce in the now isolated Machu Picchu Pueblo, a village of 4,000 residents. British backpackers were among 1,500 tourists trying to escape from Peru’s Inca citadel of Machu Picchu yesterday, which has been cut off by floods and landslides. As food supplies dwindled and hostels ran out of space many tourists were sleeping in the railway station and the town’s main square while they waited to be rescued by helicopter. Some tourists were paying up to $500 (£300) for a seat on one of the helicopters, he said. 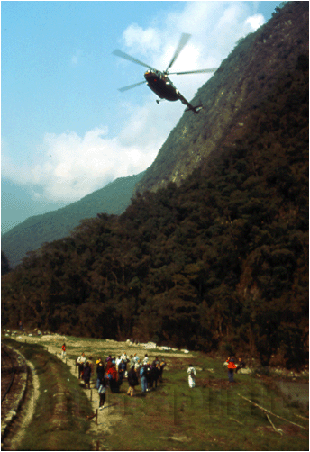 Fernando Celis, one of 300 Chileans stranded in Machu Picchu, said that people were bribing rescuers. “A helicopter arrived yesterday to take out the elderly and the unwell and some tourists who had more money. There are almost no North Americans left, only the backpackers. People on tours who were waving their money about, they were all evacuated,” he said. Cuzco government spokesman Hernet Moscoso said the Argentine, identified as Lucia Ramallo, 23, and the guide, Washington Huaraya, were in their tents when a slope gave way and their tents were crushed. Three other tourists were injured. 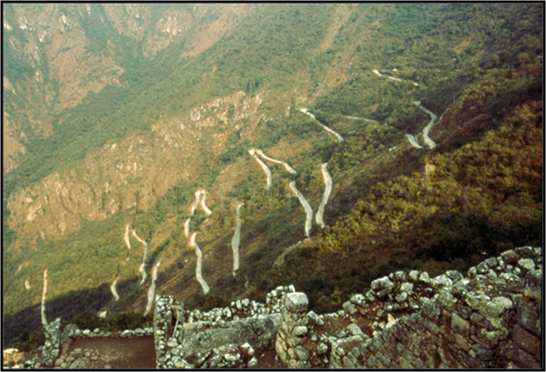 Authorities closed the Inca trail, a popular tourist trek that follows a stone path built by the ancient civilization from their capital, Cuzco, to the Machu Picchu citadel. Who are they trying to kid? You can’t fool all the people all the time. If it’s so safe, why are Americans looking bloated that drink BGH milk. Also why do so many other countries prohibit the sale of BGH milk? 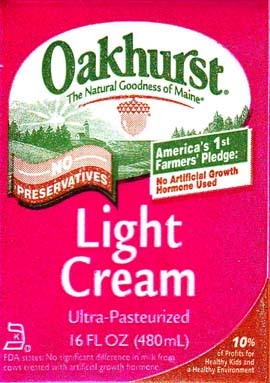 At first we thought it was some sort of trick on Oakhurst’s part. But, on second thought, we concluded it’s another strong-arm tactic of big pharma. I’ll send an email to Oakhurst in the morning and query them as to why there are two apparently contradictory statements on one carton of milk. Grand Central, St Pancras, Milano Centrale – and, er, Britomart? The main station in New Zealand’s largest city sounds as though it is named after a discount car-parts retailer. In fact, Auckland’s Britomart Transport Centre occupies a handsome Victorian building on Queen Elizabeth II Square, and is apparently named after a character from The Faerie Queene. Another Study Proves It – Live Music: Definitely good for the soul. OK . It wasn’t an official *scientific study, but ask anyone who was there, at Gerry Putnam’s CedarHouse Sound & Mastering recording studio when he hosted his annual music get-together, and they’ll tell you – Their souls felt better after having been there – both musicians and listeners alike. This year, I had the good fortune of being a listener. We had missed most of the day’s party which had started mid-morning, but we certainly weren’t short-changed for music. The party has been the brainchild of Gerry and recording artist Kathy Lowe as a vehicle to showcase Gerry’s studio for potential recording artists, and to thank past artists who had already done an album (or two, or three) at this heavenly studio, complete with a concert grand Steinway piano, and Gerry’s masterful abilities to engineer top quality albums. As the night wore on, and most of the day’s musicians had headed home, brothers Walt and Nick Kutylowski, also known as “Fat Hands” sat down and started to do a few numbers unplugged. (The day is usually fully “plugged in”). Then, Putnam pulled up a chair and started picking his classical guitar. Gerry not only recorded and mastered Fat Hands’ two albums at Cedarhouse, but ended up playing lead guitar on them as well. Enter drummer extraordinaire Dana Flewelling, (from Night Kitchen) who usually has a whole “trap set” in front of him. He sat down with a djembe and a set of brushes. My wife Amanda and I, Walt Kutylowski’s partner Christy, Mike Heffernan and Kathy Lowe were all that remained of the audience. The rest of the party-goers had all headed home in the cold night air. The music and energy that happened was nothing short of way cool. They must have played for an hour or more, and we, the privileged few, just sat there taking it in. Fathands has a few upcoming **gigs but we’re threatening to kidnap them and take them to New Zealand the next time we head down under, and from the sound of it, they might be willing go. Meanwhile, we (at Mountain Spirit Institute) will most likely be offering to put on a house concert or local venue concert for these guys if they’re up for it. They deserve to be heard. Check out Fathands, and Gerry Putnam’s Cedarhouse Sound and Mastering through the links above. * This is a scientific study about the healing power or music, by the BBC. Thanks to Mike Heffernan for getting his camera out to capture the moment. 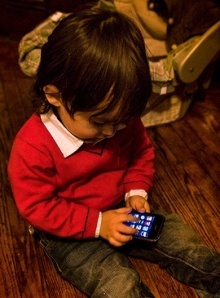 3-yr Old + iPhone = Monster? I Gave My 3 Year Old an iPhone: Have I Created a Monster? A few months back, my wife went on a girls’ weekend trip from East Coast to West, gone for a total of five days. I survived my first long stretch with our three year old daughter alone, but it wasn’t easy. At 43, I came to parenthood late in life, and I have to admit being a father is one of the hardest things I’ve ever done. During my wife’s much-needed and deserved vacation, I perhaps relied a bit too heavily on the TV for entertainment and babysitting. Read the rest of this story.. Learn what one retired high school teacher is doing to spread the word about international understanding in local New England schools. Editor’s Note: Frank Hammond was my 8th grade home-schoolroom teacher in Sunapee, NH. He was a great teacher, and left a big impression on my me, and I’m sure on my fellow classmates as well. If his Facebook “friends count” is any gauge, he’s still just as popular as ever with alumni. Thanks for the interview Frank!